A quick marinade for the chicken, freshly prepared vinaigrette and shaved (not grated) Parmesan make all the difference in this quick, tasty salad. Prepare dressing mix with oil, vinegar and water as directed on package. Pour 1/2 cup of the dressing over chicken in resealable plastic bag; seal bag. Turn bag over several times to evenly coat chicken with dressing. Refrigerate 30 min. to marinate. Meanwhile, refrigerate remaining dressing for later use. Preheat grill to medium heat. Remove chicken from marinade; discard bag and marinade. Grill chicken 5 min. on each side or until cooked through (165°F). Slice chicken. Toss greens with tomatoes and squash; place on serving platter. 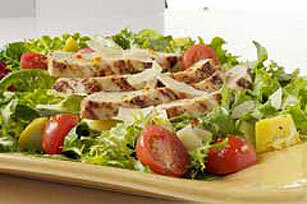 Top with chicken and cheese; drizzle with remaining dressing. This main-dish salad provides 2 cups of the recommended 2-1/2 cups of vegetables per day.